Laurence A. Levine, MD is a Professor of Urology in the Department of Urology at Rush University Medical Center in Chicago. He is a nationally and internationally recognized authority in the treatment of erectile dysfunction and Peyronie’s disease. Dr. Levine maintains a busy clinical practice while also teaching residents and physicians worldwide in the fields of reconstructive urology and andrology. His academic contributions to date include 160 published articles and 45 book chapters, as well as 2 books specifically on Peyronie’s disease. His peers have selected him since 1998 to be included in the ‘Best Doctors in America’, and he has been recognized for the past 18 years as a Top Doctor in the field of Urology by Chicago Magazine. In 2015, Dr. Levine was given a Lifetime Achievement award by the Sexual Medicine Society of North America for his contributions to the field. I'm honored that Dr. Levine agreed to be interviewed by My Peyronie's and immensely grateful for his comprehensive answers. Dr. Levine, I cannot thank you enough on behalf of My Peyronie's readers for taking the time and providing such a detailed invaluable information. In my opinion, this interview is a MUST read for any man suspecting he may have Peyronie's or that has recently been diagnosed with Peyronie's disease. 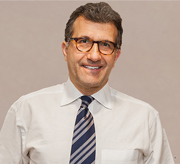 For more information about Dr. Laurence A. Levine, visit UroPartners .